The sad loss of two horses after the running of Tuesday’s Melbourne Cup certainly took the shine off what was an impressive win by the fine German stallion Protectionist. Racing lost two talented performers. First, the Japanese stallion Admire Rakti collapsed and died in his stall from a fatal heart arrhythmia in the minutes following the race. Then, the German-bred stallion Araldo was euthanised at a veterinary hospital after breaking a pastern when he kicked a fence near the Flemington rose garden while being returned to scale. He appeared to have been spooked by someone waving an Australian flag. What followed was a predictable media debate. The animal advocates opposed to racing used this capital to promote their cause, and the industry defended its record. But what rips my underpants are the racing journalists who inevitably feel the need to effectively leap to the defence of the industry. 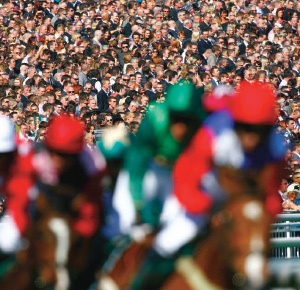 Do we get a reasoned set of arguments and a balanced view on the risks of racing? No, we get the kind of material that Barry Lichter wrote on Stuff.co.nz, under the headline, “Lichter: Bleeding hearts ill-informed over racing” – a headline I am sure he did not write. I should say that I respect Lichter as a racing journalist – certainly far more so than some of his colleagues. However, I do have a fundamental problem when racing journalists – defenders of the faith – leap to the defence of the industry, writing stories which will no doubt score them a few brownie points when they have a few beers with their racing mates down at the pub. The problem I have is that I have never read one of these accounts – and I’ve read hundreds of them across many different international racing jurisdictions over many years – that actually provides any balance to what should be an important and necessary debate. I am not going to dissect Lichter’s piece. He makes some perfectly reasonable points, but, as is so often the case with these pieces – it doesn’t deliver anything like the balance required to properly address these arguments. Deaths: There are enough racehorse deaths for this to remain a public relations problem for racing jurisdictions around the world. Racing bodies work hard to keep the number of deaths to a minimum, but jumps racing is especially open to criticism. Injuries: This rates as a serious problem for the industry. Horses are injury-prone and leg injuries can easily be career-ending or life-threatening. What fate befalls these horses? Many people don’t like the young age at which these racehorses are worked hard. Drugs: Again, for most racing jurisdictions, there are enough drug issues coming under the spotlight to cause a public relations problem. No-one likes drugs in sport, especially when the athlete has no choice in the matter. Whipping: Racing organisations are at pains to point out that they use padded whips, but many members of the public do not like to watch horses being whipped down the home straight. Retirement: Most racehorses don’t have successful or long careers. What happens to these horses when they are no longer wanted by the racing industry? If the industry was as good at placing these horses into good long-term homes as some claim, the wider horse world would be awash with off-the-track thoroughbreds. Personally, I don’t see it. In reality, far too many of them end up going to slaughter, either for pet food or human consumption. Off-the-track thoroughbreds will often require a lot of work. They may be under saddle, but many will still be very green. So, the whole debate involves much more than a fatal arrhythmia or, in the case of Araldo, an incident described by Racing Victoria’s head vet, Dr Brian Stewart, as a freak accident. Before making my final point, I want to quickly deal with the Araldo incident. I do not consider this to be a freak accident at all. I watched on television as the Melbourne Cup winner was being returned to scale, and personally felt that the adoring mob was too close. I felt it was just as well that Protectionist had just galloped two miles, which would have taken some of the fizz out of him. Araldo met the waving flag on precisely the same route. Imagine if Protectionist had been the victim, in front of millions live on television? Of course, the most illuminating part of Lichter’s piece lies beneath it on the Stuff website – the 347 comments by readers at the time of writing. If racing pundits wonder whether it has a public image problem, they’ll find the answer here. Some people simply don’t like what the industry represents and no amount of reforms will satisfy them. But there are also clearly widespread concerns over deaths, injuries, drugs, whipping, and the long-term fate of retired horses across all racing codes. And they collectively amount to a monumental problem for the industry. While I can’t stand racing, neither of these incidents were ‘track’ related. The broken pastern was an accident that could have happened with two horses goofing off in a field and the fatal heart arrhythmia could just as easily have happened after jumping a course during training or after an exuberant gallop in the paddock. Had either horse died on the track due to a fall or break-down, that would be completely different. While tragic, these two deaths weren’t anything out of the ordinary. Not completely different: just the difference between one unique incident and another similar but also unique incident. I specialise in forensic consideration of equestrian accidents and, like snowflakes, while they are all similar in some ways, no two are ever exactly the same. Carey, who are you actually trying to convince; Yourself or Us? Ignorance & denial on full display . I have yet to decide if I feel pity or contempt for such weaknesses. The only problem is that you cannot expect anyone to deal all the time and every time with all the issues of anything in a limited number of column inches. Reporting on the aspects of one particular ‘crime’ cannot be expected to deal with the fabric of Society as a whole. Newspapers tend to deal with only the latest aspect of anything. Magazines are weightier and books even more so.. Licter’s piece is just that.. A piece. The hole in your theory of balance is precisely because you expect a piece to be a whole. Your article is longer and so because you can and do make more points, you have done well thereby to balance them.. A luxury seldom to be permitted by their editors to reporters. A reporter reports: A commentator comments and never the twain should meet.